Search the title, description and tags of a page. 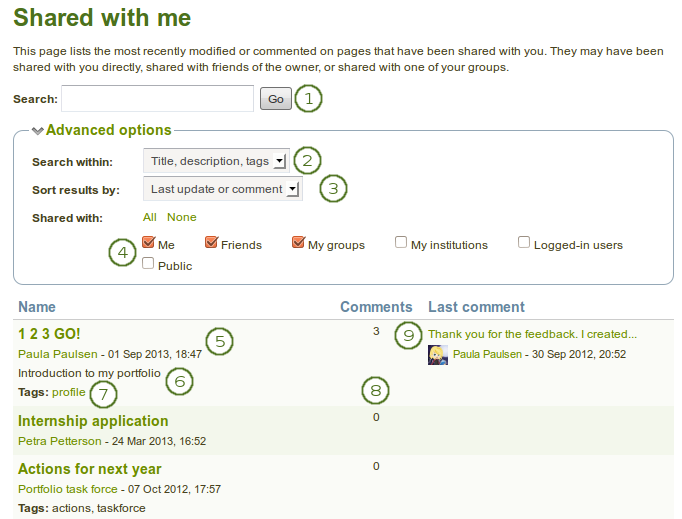 Show results of pages that have been shared with you directly, as a friend or a member of a group. Shared with me is a place where you can find the pages that you may be most interested in. Search by title, description and tags of a page per default. More search options are provided under Advanced options. Search within: Limit your search results to the word(s) found in the title, description or tags of a page or search only within tags. The title and author of the page are linked for you to jump to them quickly. You also see when the page was last updated. Tags on your own pages are linked for you to easily jump to them on the My tags page. You see the number of comments on each page. The beginning of the latest comment on the page as well as its author and the date when the comment was left are displayed. By clicking on the comment, you can read it in its entirety.